Why No Updates for so long? Im sorry that Fantastic F4 Fansite have not been updating for the whole 3 months. As I am really busy with my studies recently due to streaming exams. However, my exams will end in around 3 weeks time which is 27 Oct 2002. I will continue to update after that. Please wait patiently. Be assured that I am not going to retire as my passion towards F4 had not changed at all. 1) Why are the clips in the Downloads section unable to access? Reply: I will look into this matter and hope to solve it after my exams. Please wait patiently. 2) Can I have F4 latest news? Reply: In the past, I used to updated the news in forum very regularly. But since I am having exams, I don't get to go online often. Regular update of news will resume after my exams. 3) Since you are so busy, can I help you to manage this site? Reply: Currently, I do not need any helper. Reason being, I don't think this small site deserve helpers. Usually there are helpers because the site is popular, well-known and big community. However, this is just a simply plain fansite. Therefore, I don't really need much help. And also, everything had not been standardize. Therefore, it is very difficult to divide the job and also giving accounts and passwords. > More Pictures added, all in the new server picture hosting. > Added a new server for the pictures hosting, as the old server was full. Therefore, any new updates of pictures will be in the new server in the future. And for searching of old pictures, you can still visit the old server. >Closed down officially at Fantastic F4 Site on 24 June 2002. Sorry not being to update these few days, Due to opening of school. Updates in the future will continue, however, it will not be weekly.. maybe two weeks once or three weeks or even one month. I will try my best to updates as much as I can. You can also visit this site regularly for the latest news that will be posted up-to-date in forum. 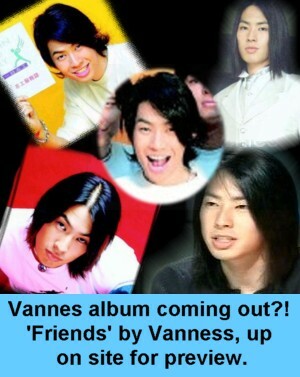 It was said that Vanness album will be out soon, check it out. Auctions section will be close on 24 June 2002.
please email your contributions to zai4eva@fantasticf4.cjb.net. Credits will be written accordingly.